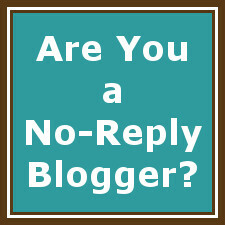 Val's Quilting Studio : Are you a No-Reply Blogger? She let me know I was a no-reply blogger...and I don't want that!! Soooo...if you are not receiving replies to the nice comments that you leave on other peoples blogs; if you find yourself going back to their blog to see if they replied; you may not be getting the replies because you may be a no reply-comment on blogger. There's a great tutorial by Robyn at Fluster Buster that tells you how to see if you are a no-reply blogger and how to fix it! Thanks for the shout out, Val! Glad you are no-reply...no more!